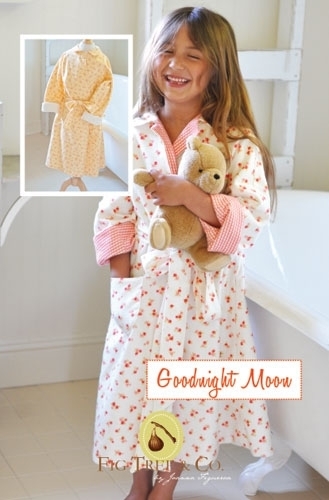 Goodnight Moon- A snugly robe pattern perfect for any time of the year! Children's sizes 5-10 in a classic, simple robe style with two different collar and pocket options for both boys and girls. Great pattern for beginners. So snugly if made out of flannel and more lightweight if made from cotton. A perfect summer afternoon project! A three piece pattern with an optional pocket, this robe is a dream to sew for any level of sewer. Change the collar & pocket shape and the robe is instantly perfect for the boys as well as the girls in your life. Pattern includes full size paper templates for sizes 5-7 and 8-10 with a guide on further adjustments for more sizes. A collar and pocket choice for both boys and girls is also provided. All sizes (children's sizes 5-10) included in one pattern.